I don’t care much for trends and bandwagons. I don’t fall prey to marketing jargon, and I don’t like to do things just because everyone else is. I’m probably the least-easily peer-pressured person you’ll ever meet. For the most part, I’ll turn my head and say “I’ll keep my feet firmly planted on scientific ground, thanks”. But fungal acne has changed that. Fungal acne has been the cool kid in the skin care community for a while now. And it’s because almost everyone can relate in one way or another. People find it comforting that maybe – just maybe – their stubborn, recurring pimples that resist treatment aren’t acne, but a different beast entirely. I thought “this is all well and good for the average dabbler in skin care – but not me”. Maybe they’d find a solution in fungal acne treatments, maybe they’d go back to conventional treatments, or maybe they’re suffering from something else entirely and this is a learning step along the way to reaching their skin care paradise. I tried my best to ignore the growing buzz around the topic because, well, I’ve been burned before. I thought that getting invested would get my hopes up and have them dashed. I felt deep down that my skin was unsalvageable. For the better part of my life, I’ve struggled with shocking skin. 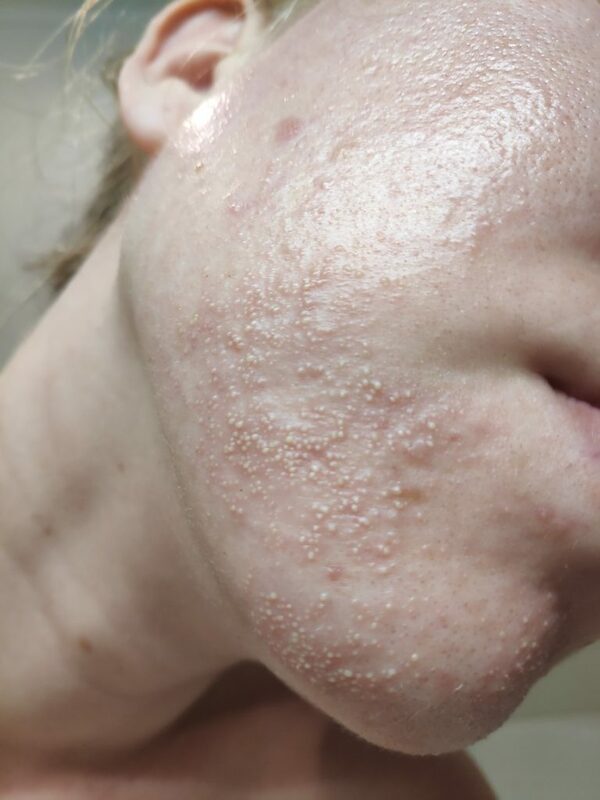 Not your typical ‘bad teenage skin’, but really awful stuff. It caused me so much emotional pain, due to cruel comments and my own negative self worth stemming from the unsightly appearance of my skin over more than a decade. Even as I grew into skin care and found a good routine earlier than most and my skin improved, I’ve never had ‘good’ skin. My texture was never ever smooth, always slightly irritated and bumpy looking. No amount of makeup could cover it. It would drive me insane when friends said they couldn’t notice it, or my skin was fine, but I’d do their makeup and feel the softness of their skin and compare it to mine, and I knew that something was wrong. Even at its best and with perfect treatment, my skin would regularly relapse for seemingly no reason. Treating myself for dehydration was a huge step to getting my skin 75% healed. I convinced myself that that was enough and got over it. But just as if to prove that life is one big ever-changing roller coaster, the past year I struggled more and more with dramatic skin problems. I thought “there’s no way this fungal acne be real – these treatments won’t solve anything”. But I got down off my high horse and tried out some of the fungal acne treatments – and I found that fungi have been the cause of my severe ‘acne’, and took steps to finally be rid of it. Warning: Let’s hope you’re morbidly curious – this is yet another post that includes some graphic, unflattering, real photos of my skin. You’re not looking at a filter or my good angles – this is the real deal and it’s ugly! Also, please excuse the many lip/nostril close-ups I’m about to expose you to. The worst of the attacks came in waves. 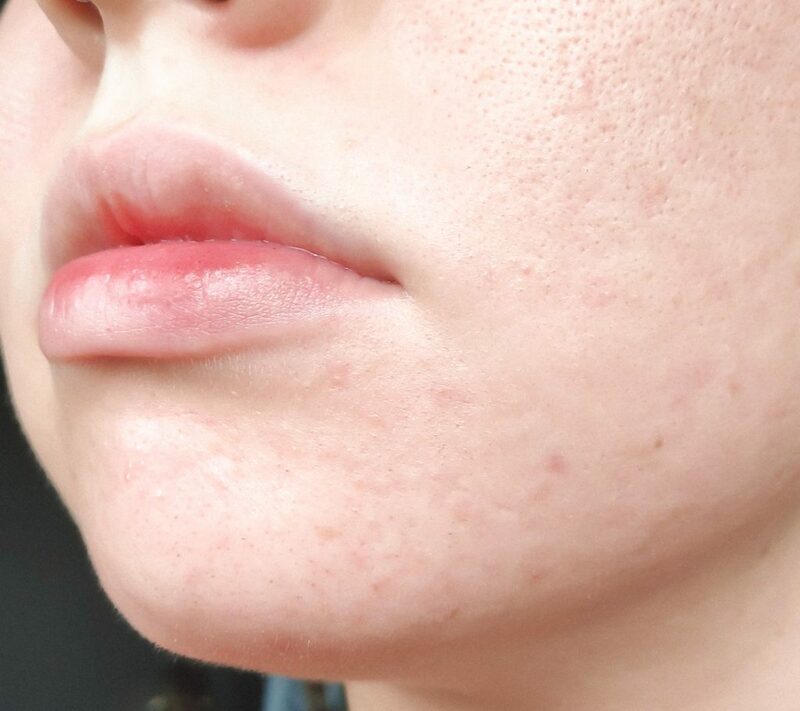 Every cycle of these flare ups would start the same – on an otherwise fine skin day, the absolutely tiniest of whiteheads would appear. Maybe it was one or two, or up to ten, but they were pinprick sized and grouped together. I could easily scratch them off with a finger, leaving behind only a tiny red mark. It was barely enough to take notice of. When you’ve suffered from terrible skin your whole life, you’d look at these and think “pfft, so what?”. And so would I. Then, the next morning I’d wake up and my skin would feel rough. Really strange, like I’d got a layer of Elmer’s glue on and I just wanted to rub it off. It feels grainy and dry. When I looked in the mirror, my heart sank. I could see hundreds of teeny tiny inflamed whiteheads. They might not look like much now, but by this stage after 6 separate episodes, I knew what was about to come – and I couldn’t do anything to stop it. Thousands upon thousands of blisters sprouted and spread like wildfire. They started and would be worst on my chin. If I picked at them, they would leave behind a red mark. They traveled up my cheeks and even onto my forehead. They were so unbelievably itchy and painful. The texture is appalling. Under strong lighting, you can see the deep swelling and damage being done to my skin. No traditional acne treatments I’d put on my skin would touch it. It was just a matter of waiting it out. Around 3-5 days from the initial outbreak, slow and painful healing began. New whiteheads stopped appearing and old ones dried up into a crusty, sore layer. The texture slowly began to flatter and small areas of skin returned to a more normal colour. I would be left with highly vulnerable post-inflammatory erythema and some hyperpigmentation that took weeks if not months to clear. For someone like me who has struggled with a compulsive skin picking disorder, this can wreck my relationship with my skin and bring me right back down again. The worst part about all of this? Just weeks or even days later, the first few tiny bumps crop up and I know I’m in for it all over again. I would never fully heal, and even my best days were bumpy and red. It’s absolutely draining mentally to know that your skin is about to go through a horrendous experience, and not to be able to do anything to stop it and having no idea WHY it’s happening. I’ve been through this cycle during a highly important job interview, and it tanked my self esteem – not to mention being a huge eyesore and undoubtedly a negative factor. There is an upside to all this. After trying every other avenue, I gave what seemed like a crazy idea a try. Topical antifungal cream on my face. I used a clindamycin cream designed for athletes foot, ringworm, thrush (ew) etc. And… it worked. Just a bit, my skin looked less angry. I waited it out until I had one more flare up. Then I finally cracked and went to a doctor during the worst of it, who took one look at my skin and started listening to me and taking me seriously. After speaking about taking antibiotics in the past and the minor success of the clindamycin cream, she and I decided to give oral antifungals a try. Within days, my skin looked better than it’s pretty much ever looked since I was 13. Not just ‘good’ – or what I used to think was good – but amazing. Radiant. Smooth and calm. I literally cried. All the pain and stress and failed acne treatments fixed with a simple doctor’s visit. I wish it was easier and that there was a way to cure it at home. But I believe that for a severe, recurring case like mine, the best thing I did was to move on from at-home treatments to seeing a doctor. 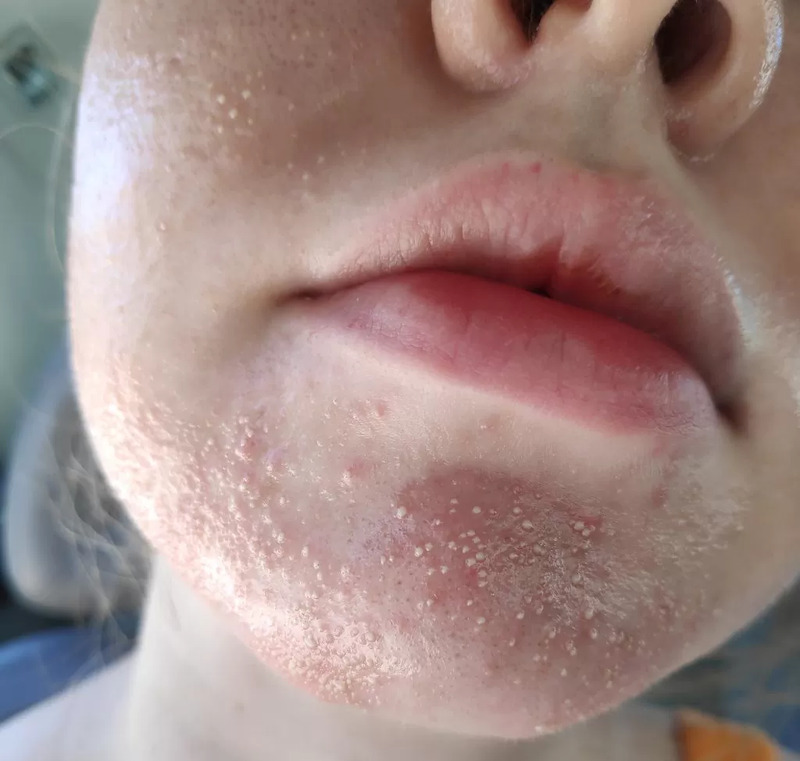 But what was wrong with me – what is fungal folliculitis/fungal acne? To understand that, you first have to know that our skin is covered in tiny organisms. Think bacteria, mites and yes – fungi. That’s totally normal. What’s not normal is any one of these taking over and over-populating the skin. At high levels, anything will begin to cause issues. Everything that makes up our skin flora lives in harmony. A wide range of organisms – from bacteria to even mites – share the surface, feeding on our skin cells and oils, and usually causing few problems. Eradication of other organisms like bacteria, such as when you take antibiotics, can give fungi the room to become too strong and overtake the natural balance. Imbalanced hormones or a predisposition to certain skin types and conditions like extreme oiliness, low cell turnover, and eczema can feed fungal overgrowth or allow infections to take hold quickly in broken skin. Finally, lifestyle choices such as hygiene habits, activities like sports, and even certain environments just lend themselves well to fungi. Think of being hot, sweaty and humid. Anything that creates excess heat, oil, or moisture – especially if it’s not washed off quickly – can promote fungal overgrowth. So how did I figure out that I had it? I had a red, bumpy skin texture even between my pimples and on a good day. My lips, especially around the edges, would feel thick like they have a layer of dead skin, and itch all day. Sometimes my chest would break out in red dots, most often after exercising. No amount of anti-acne treatment would touch the endless deepest, sore pimples and the tiny whiteheads! Why is fungal folliculitis so hard to treat? Fungal folliculitis actually commonly referred to as pseudo-acne. Many teens develop the condition and don’t respond to traditional acne treatment and kind of just get… left behind. Because acne is so common, many doctors don’t take the time to consider it could be something else. Also, oral antifungals can be hard on organs of the body so many medical practitioners are reluctant to prescribe them without proven attempts at a traditional antibacterial acne regimen. 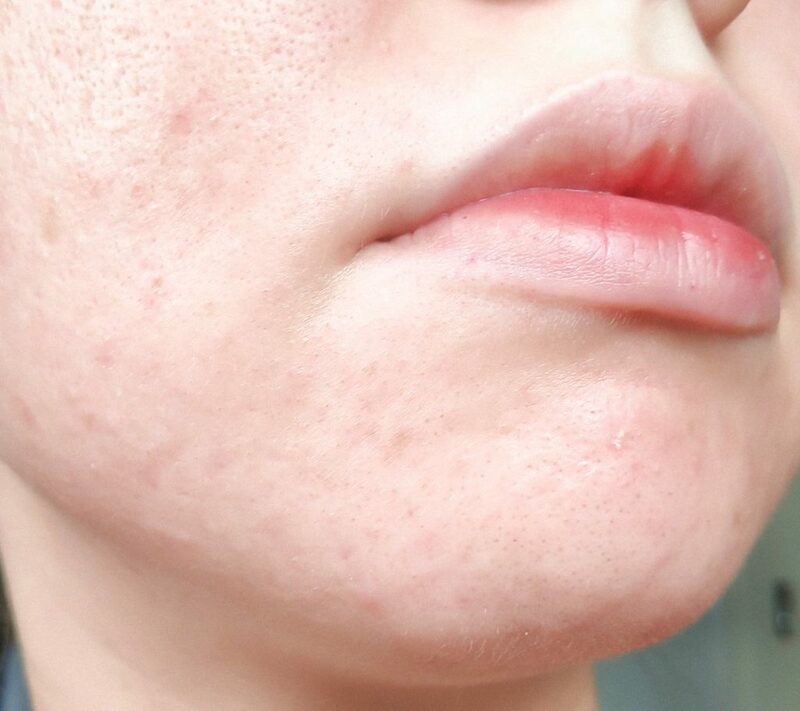 There’s a general lack of awareness around fungal acne, so it’s important to educate yourself, keep track of what treatments you’ve tried and what you’ve not, and be an advocate for trying something new if you think it might be what’s plaguing you. What you’ve all been waiting for – here’s how my skin looks today, one month after starting my course of antifungals. It’ll never be perfect, but look at the difference compared to at its worst! I can’t wait to see where I go from here without fungal infections holding me back. This post isn’t to congratulate myself, to convince you to go on medication, or to say that every case of stubborn acne is fungal – but rather to say that an open mind is always the best way to solve any problem. You might end up like me, and find a solution you never even thought possible. Final note: I have to thank F.C. over at Simple Skincare Science blog. He has made the famous Malassezia Folliculitis post that I referenced many times during my research. It’s one of the most informative posts I can recommend to you all. There’s fascinating explanations of the science behind why we get fungal acne, what products feed it and what products prevent it. What’s the biggest thing you’ve found yourself changing your tune about?